Halloween came early at the Cedar City Aquatic Center. 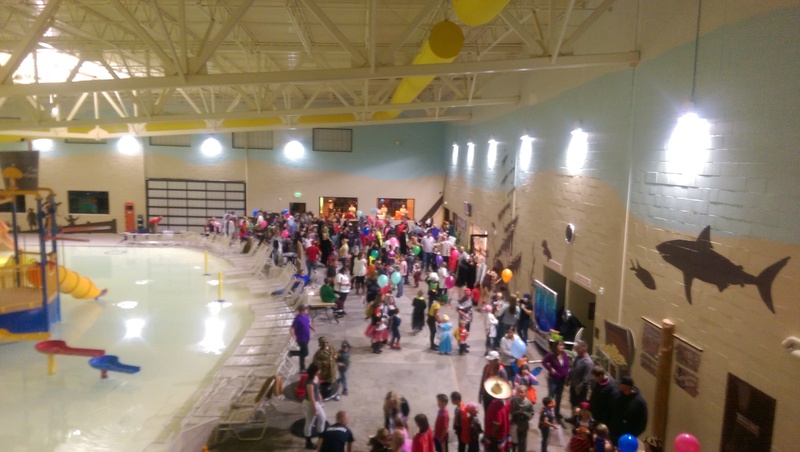 Nearly 600 goblins flocked to the aquatic center for the third annual Spoortacular Celebration. The center closed early on Saturday and the pool was transformed into a holiday festival complete with games, crafts and of course, a spook alley. Event organizer Liz Okeson stated “the event has grown over the past few years. We have a few staff that love this kind of thing. Me included” The event was sponsored by Cedar City with over 30 volunteers helping at craft and carnival booths. “We wanted to move the event outside on the pool deck but the weather did not cooperate” said Okeson. An addition to the event this year was BACA, Bikers against child abuse offered free train rides to bring awareness to their organization. Other volunteers included the local ROTC, and SUU engagement center. Another change this year was a craft room for the younger participants which provided an activity to those who opted out of the spook alley. 12 different booths were set up to distribute over 12,000 pieces of candy. The purpose of the event was to offer a low cost holiday activity to the residents and showcase the Community Center. It also gave the youth (and adults) another opportunity to wear their costumes. Some changes for next year include pre-selling tickets to avoid the entrance line and to utilize more of the center to avoid congestion. Leisure Services Director Dan Rodgerson stated he anticipates the event will grow each year and plans are already in the works for a more elaborate event next year. Anyone interested in helping with the event next year is encouraged to contact the Aquatic Center.